Rock superstar Tom Petty confesses he felt like just another weak-kneed fan when he met music legend Roy Orbison a year ago. 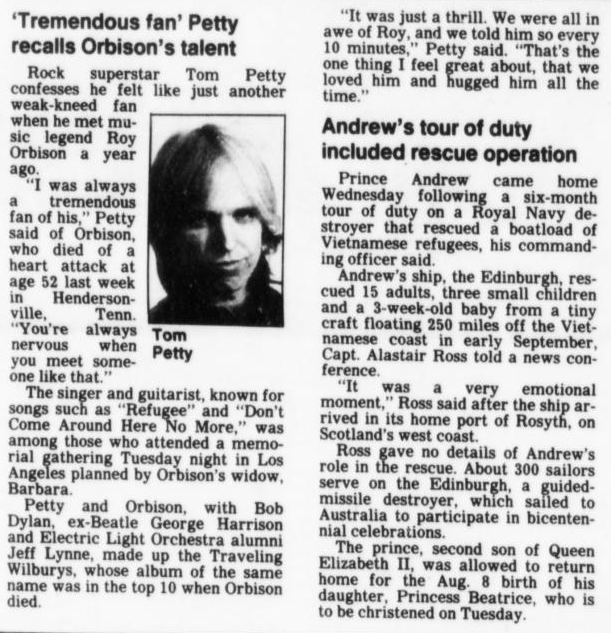 "I was always a tremendous fan of his," Petty said of Orbison, who died of a heart attack at age 52 last week in Hendersonville, Tenn. "You're always nervous when you meet someone like that." The singer and guitarist, known for songs such as "Refugee" and "Don't Come Around Here No More," was among those who attended a memorial gathering Tuesday night in Los Angeles planned by Orbison's widow, Barbara. Petty and Orbison, with Bob Dylan, ex-Beatle George Harrison and Electric Light Orchestra alumni Jeff Lynne, made up the Traveling Wilburys, whose album of the same name was in the top 10 when Orbison died. "It was just a thrill. We were all in awe of Roy, and we told him so every 10 minutes," Petty said. "That's the one thing I feel great about, that we loved him and hugged him all the time."